Hands down, I believe that VMware Fusion 2 is the best option for those who are looking to run Mac OS X as their primary operating system but also have Windows and Linux as readily accessible environments. Virtualization is a relatively old technology. For those who aren’t familiar with it, the concept basically involves running a platform (like Mac OS X) and then simultaneously running Windows and/or Linux within the aforementioned platform. Of course, these are referred to as “virtualized” environments (since they are being run in memory) rather than the “native” environments most people are used to; however, for quickly accessing programs which can only be run on a specific OS, virtualization is a fantastic option rather than having to restart the computer to boot into another OS. Boot Camp, a utility specifically designed by Apple to facilitate the installation of Windows XP/Vista on Intel-based Mac OS X Leopard installations, is a suitable option for those who require a native Windows environment. One example that comes to mind is playing Windows games on a Mac. However, since this provides users with a native Windows environment, a restart would be required to switch between operating systems. VMware Fusion 2 and Parallels Desktop 3 are both capable of creating virtual machines on Mac OS X; however, what makes me lean towards VMware Fusion 2 is the vast support for Linux out of the box. Both programs offer an integration utility when you’re installing a Windows virtual machine. For example, in VMware Fusion 2, when I start my Windows virtual machine, I can have both the Windows start-menu and my Mac dock menu overlayed on top of each other for a seamless integration. This is also possible in Parallels Desktop 3; however, only VMware Fusion 2 supports this same feature with Linux virtual machines and therefore has my vote. VMware Fusion 2 is incredibly fast, stable, and has great OS-specific support through its VMware Tools repository. Since I only need to use an application or two in both Linux and Windows and I have 4 GB of RAM and 200 GB of free HDD space, I found virtual machines with VMware Fusion 2 to be the best option for me to have the best of all three operating systems on my MacBook. 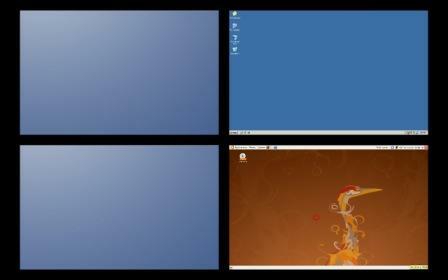 Here’s an image of what my Spaces feature looks like on Leopard when I host each OS on a different “space.” The top right is Windows XP Professional and the bottom right is Ubuntu Hardy Heron Linux. I configured the each virtual machine to use 1 GB of RAM, and from my experiences, that’s more than sufficient. The temperature of my MacBook did increase, as expected, but no more than ten degrees above my normal readings. Hope this helps! Hi Elijah. Though I didn’t take any time measurements comparing the overall speed of VMware Fusion 2 and Parallels 3, I can vouch for Fusion feeling “faster” (on my MacBook). I posted a picture of how I routinely use the three operating systems simultaneously by utilizing Leopard’s “Spaces” feature.